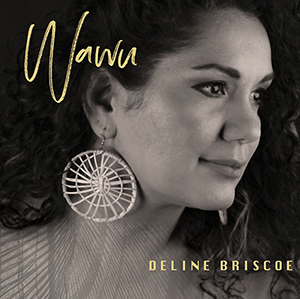 Deline Briscoe‘s sublime backing vocals have accompanied iconic Australian artists. A few less feet from stardom, she’s graced ensembles including Black Arm Band, Mission Songs Project and Blak Cabaret. Now, Wawu offers her own story within a continuum of inherited experience and memory. Briscoe brings stories of her mother, her daughter and her mother’s mother together across time. Wawu is a Yalanji word for the communion of spirit, heart, love and land. In song and spoken word, stolen generations anguish hangs in the air. ‘Tree’ is a hymn to nature. ‘Joe’ is a declaration of independence by a woman once mistreated. Jazz, soul and hip-hop fusions see tempos change in a fluid trajectory. There’s a dash of salsa, horns, dance floor funk, even a sonic ‘Radiohead’ moment. The band: Airileke Ingram (drums), Robbie Finch (double bass), Stephen Maxwell (piano), Paul Coyle (trumpet) and Phil Bywater (clarinet/saxophone). Guest writers and performers include Jessie Lloyd, Jess Hitchcock and Emma Donovan, Tiddas, Bart Willoughby and Briscoe’s daughter Jade. ‘Sonrise’ pairs Briscoe with Andrea Keller on exquisite jazz piano. An ambitious, nuanced and stylish representation of an artist whose time has come.